Programme Fee – INR 1500 per module. Participants also have an option to register for all the five modules by paying INR 6250. One of Yoga’s most subtle and yet deeply powerful tools is Prāṇāyāma. In fact, Sri T Krishnamacharya highlights the practice of Prāṇāyāma as one of the highest forms of Tapas, or discipline done to eliminate impurities from all dimensions of the body. According to the Hathayoga-pradipika, the improper practice of Prāṇāyāma may lead to different illnesses; however, when properly and systematically practiced, under the guidance on an experienced teacher, Prāṇāyāma can offer diverse physical and mental health benefits. 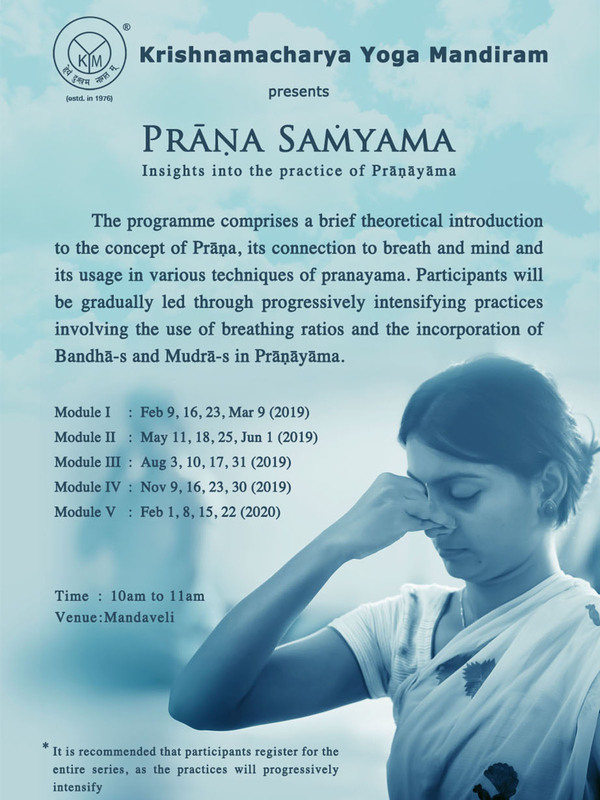 These master classes comprise a brief theoretical introduction to the concept of Prāṇa, its connection to breath and mind and its usage in various techniques of Prāṇāyāma. Participants will be gradually led through progressively intensifying practices involving the use of breathing ratios and the incorporation of Bandha-s and Mudra-s in Prāṇāyāma. This is an advanced study class and it requires applicants to go through a preliminary assessment, prior to enrolling. This class will be led by MR. V Srinivasan, senior faculty of KYM, who has over 15 years of teaching experience.